How are climate change, urban design, epidemiology, and biodiversity related? 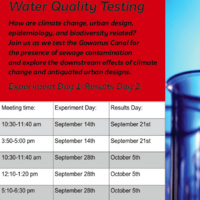 Join us as we test the Gowanus Canal for the presence of sewage contamination and explore the downstream effects of climate change and antiquated urban designs. Please note: Each Water Quality lab is a two session experiment. The dates for attendance are one week apart and in the same time slot.